LED lights markets in Europe, the US, and Japan have gradually matured, and China is also entering a period of intense competitions over pricing and scale. With the formation of the ASEAN Economic Community, LED suppliers attention on the emerging markets in Southeast Asia has grown over the years. According to a recent estimation by Trendforce, the LED lights markets of the six major Southeast Asian countries – Thailand, Singapore, Malaysia, Vietnam, Indonesia, and Philippines – had a total value of US$4.5 billion in 2014. Out of that amount, around US$1.1 billion came from the LED lights market. The growing infrastructure needs within the countries of Southeast Asia are expected to bring great demands for LED lights as well. 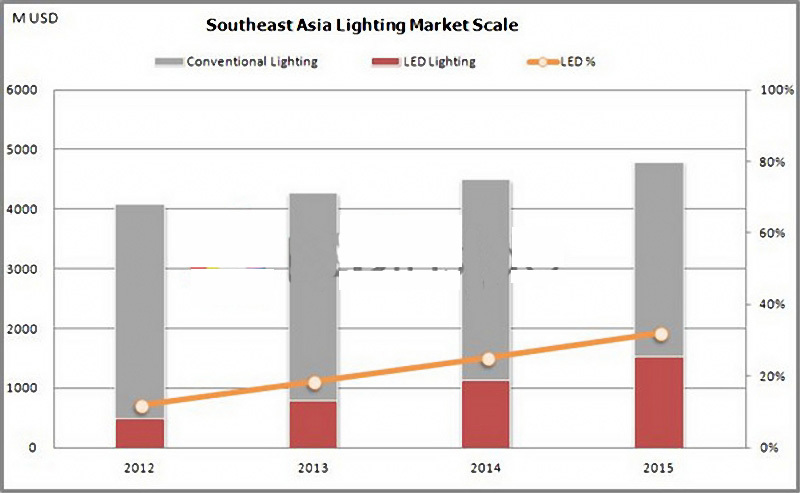 Southeast Asia LED lights market had the fastest pace of growth in 2013 with a year-on-year increase of 63%. Though hung back growth during the 2014-2015 period, the rate was kept at 30% and above. Also, the market penetration rate of LED lights in Southeast Asia has risen with each passing year and at an higher speed. Overall, the market penetration rate of LED lights in the region is projected to grow from 12% to 32% within 2012-2015. Among the major countries, LED lights market demand in Singapore is highly mature and its traditional lighting segment is shrinking. As a result, LED lighting market Singapore on the whole has seen a scale reduction in the recent years. This downward trend is likely to continue in 2015. However, the scale of the LED lights segment is still growing. Besides Singapore, other countries in the region have experienced overall positive growths in their LED lighting markets during the same period. As a general decline set on these markets traditional lighting segment, LED light has become the main growth driver. Indonesia in particular leads in market size of the general lighting as well as LED lighting. Based on some professional estimation, general LED lighting market in Indonesia would be valued at US$320 million in 2014.